In the heart of downtown San Luis Obispo you&apos;ll find Granada Hotel & Bistro, a unique boutique hotel tucked into a beautifully restored brick building on Chorro Street. The Bistro offers up delicious and locally sourced eats, cocktails, local wines and craft beers and an ambiance that can&apos;t be beat. Whether you choose the cozy outdoor patio or sit indoors underneath the warm lighting, this is a definite &apos;must&apos; on your to-do list. 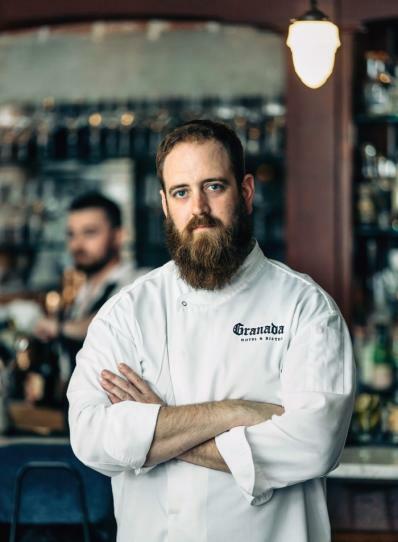 Get to know Granada Bistro a bit more and meet the man behind the dishes, Executive Chef Kenny Bigwood. I actually kind of fell into the culinary world. I was a student at Cal Poly and graduated with a degree in English Lit, with a concentration in creative writing. I enjoyed living in SLO and didn&apos;t want to move to anywhere in particular so I started looking for work here. A friend of mine was working at a local bakery, the House of Bread, and helped me get hired there as a part-time retail associate. This was about the time that the “Top Chef” and celebrity chef craze was getting into full swing, and in my free time I had been spending time learning to cook new and interesting foods. I ended up working at HoB for 4 years in total, moving from retail associate, to lunch cook, to assistant baker. One of our regulars was local chef Julie Simon (then at Thomas Hill Organics in Paso, now at Foremost Wine Company in SLO) and one day I told her I was interested in finding work in a kitchen and asked if she knew of any openings anywhere. She wrote down THO&apos;s address and told me to come in the next afternoon. When you’re not ‘chefing’ what do you like to do? As most chefs can tell you, cheffing is more than a full time job... but when I do manage to get away I like visiting my fellow chefs at their restaurants to try their latest creations. 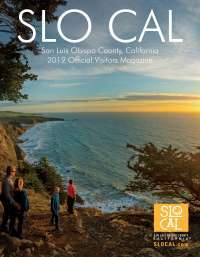 SLO is also a beautiful place to spend time out in nature, taking (easy) hikes, hanging out at the beach. I also will spend any free moment I can get curled up with a book. What is one of your favorite culinary trends you’ve seen in SLO County and why? I think it was probably Sidecar who started it but I love that one of my favorite vegetables- brussels sprouts- can be found on menus all across town. I even feature a rendition of them on my restaurant month menu! What inspires you when you’re creating new recipes or menus? I often find that inspiration strikes in the strangest places. Sometimes I&apos;ll be walking down the street and smell something while thinking about another thing and they&apos;ll mash together in my head. I am also often inspired by dishes I see in other places whether it&apos;s on TV, in a magazine, or something I eat in another restaurant. I&apos;ll taste a combination of flavors and wonder how it could be reimagined, or what I would replace or change to make it more my own. What is one of your favorite recipes you love to make at home? One of my all time favorite things to do is make pork ribs, and there was a shockingly long period where every time I had a day off I&apos;d fire some up. I don&apos;t have a single particular way I like to do them, part of the fun for me is trying a new thing, or a variation on something I&apos;ve seen before. Once I got a free sample bottle of some black cherry flavored Jim Beam that was absolutely disgusting to drink but when reduced down with a can of Dr. Pepper, made an amazing rib glaze. What is one of your favorite recipes to make at the restaurant? One of my very favorite dishes on the menu at Granada is one that&apos;s only available for two hours a day! During our Aperitif Hour(s) between the end of lunch at 3 and the beginning of dinner at 5, you can order my chicken wings. They&apos;re marinated in buttermilk and have a light breading, and come tossed in a glaze made of maple syrup, sambal oelek, and melted butter. My inspiration for them is the classic fried chicken over a buttermilk waffle, with a dash of spicy Buffalo wings. When you work with food day-in and day-out, sometimes ennui sets in, but they&apos;re one thing I could eat every single day. Check them out during Restaurant Month all January long and tell Kenny hello!